OhmConnect now “Works with Nest”. What does that mean? I noticed that OhmConnect now “Works with Nest”. What does that mean? You noticed correctly! We’ve been busy working with the team at Nest Labs to become an official “Works with Nest” service. This means that you when you connect your Nest thermostat to your OhmConnect account, your Nest will automatically be set to Eco Temperature mode (aka more energy efficient) during #OhmHours to ensure your experience is automated, delightful and rewarding. If you’re looking to connect your Nest Thermostat to OhmConnect, click here. If you're interested in purchasing a Nest Thermostat, visit our Store to learn about the rebates available in your area, and the incentives available to OhmConnect customers. How do I connect my Nest Thermostat to OhmConnect? Now that we are an official “Works with Nest” service, the process to authorize OhmConnect to enable Eco Temperatures during #OhmHours is quick and secure. After clicking the link below, you’ll need to log in to your OhmConnect account, and then you’ll be redirected to Nest’s website to log in to your Nest account. Once logged in, you’ll be asked to authorize OhmConnect to enable Eco Temperature mode during #OhmHours - and if you’re already logged in to both accounts on your computer or device, you’ll be able to connect your Nest in just one click! Click here to Connect your Nest. If you have any non-Nest smart home devices connected to your OhmConnect account (including things like a TP-Link smart plug or an ecobee smart thermostat), we automatically turn off your device at the start of an #Ohmhour, then turn the device back on at the end of the #OhmHour. Because we are now an official “Works with Nest” product, the experience with the Nest smart thermostat is much more delightful! During an #OhmHour, we won't turn off the device. Rather, we set your Nest to its Eco Temperatures setting (which can be set and modified through your Nest app), which adjusts your temperature set-point to ensure you are saving energy, but at the same time ensures your house doesn’t get too hot or cold. After the #OhmHour has finished, we’ll automatically restore your Nest thermostat back to its previous schedule. 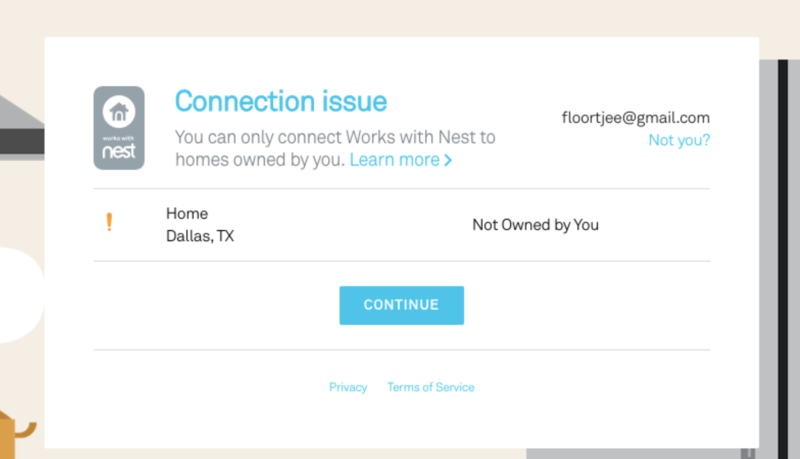 I'm seeing a "Connection issue" message when connecting my Nest. This means that you have setup a shared Nest account and used a secondary login. To fix this, you'll need to logout of your Nest account and then login to your Nest account with your "Owner" credentials for your Nest account. Once that's done, your Nest should connect properly.